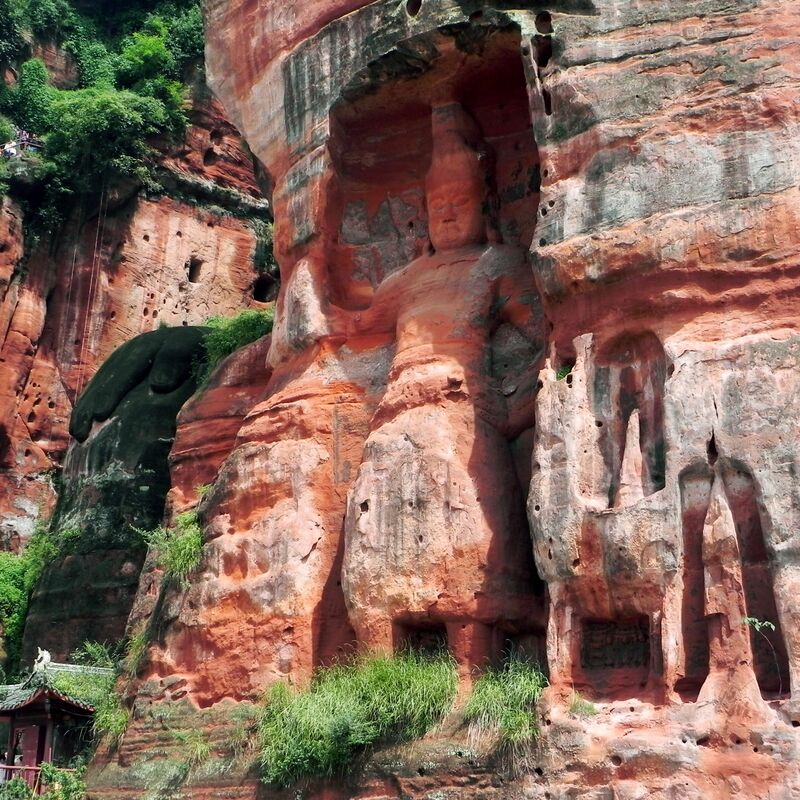 Long before starting construction of the Giant Buddha in 713 AD, the area of today’s Leshan was already known as a holy land of Chinese Buddhism. In the 1st century AD the nearby Sacred Mountain Mt. 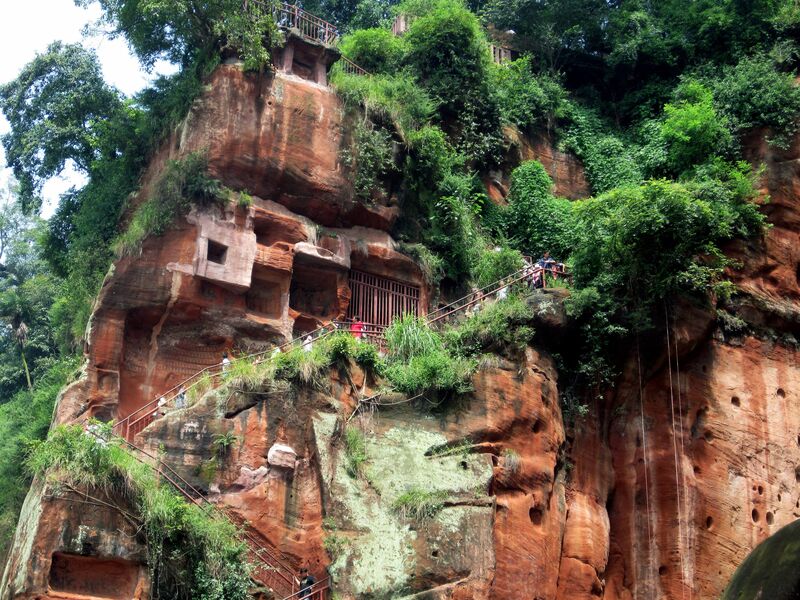 Emei (some 30 miles/50km east of Leshan) was home to the first Buddhist monastery. 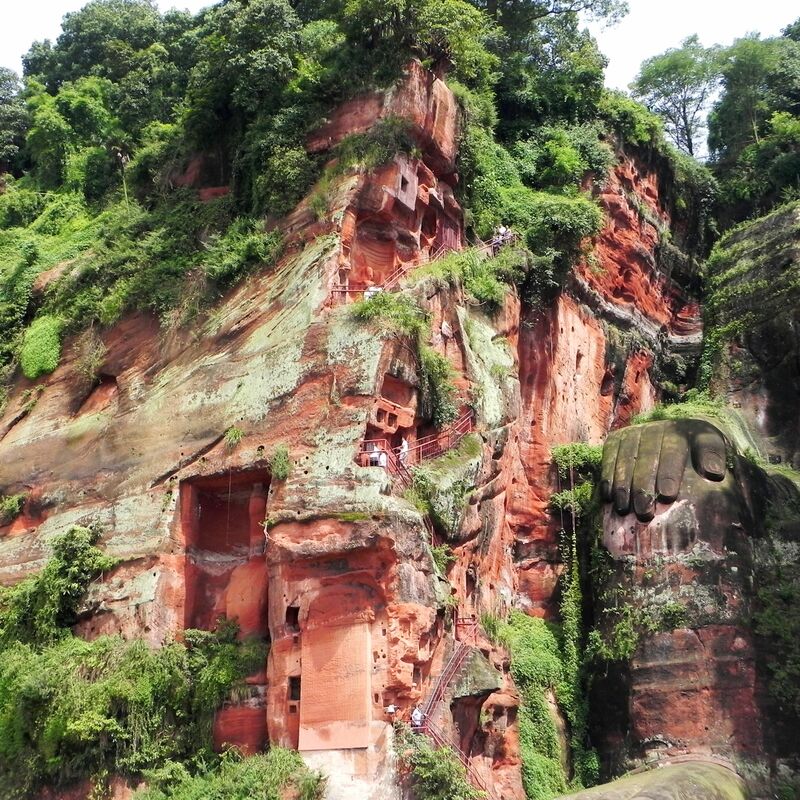 Over the time the region of Leshan-Emeishan became one of four most important Buddhist centers in the world, home to many monasteries and "teachers". Most rivers at those times served as main (if not the only) communication “highways”. But here, due to the religious significance of Mt. Emei, rivers on top of carrying commercial traffic have been also helping countless pilgrims to reach the sacred place. 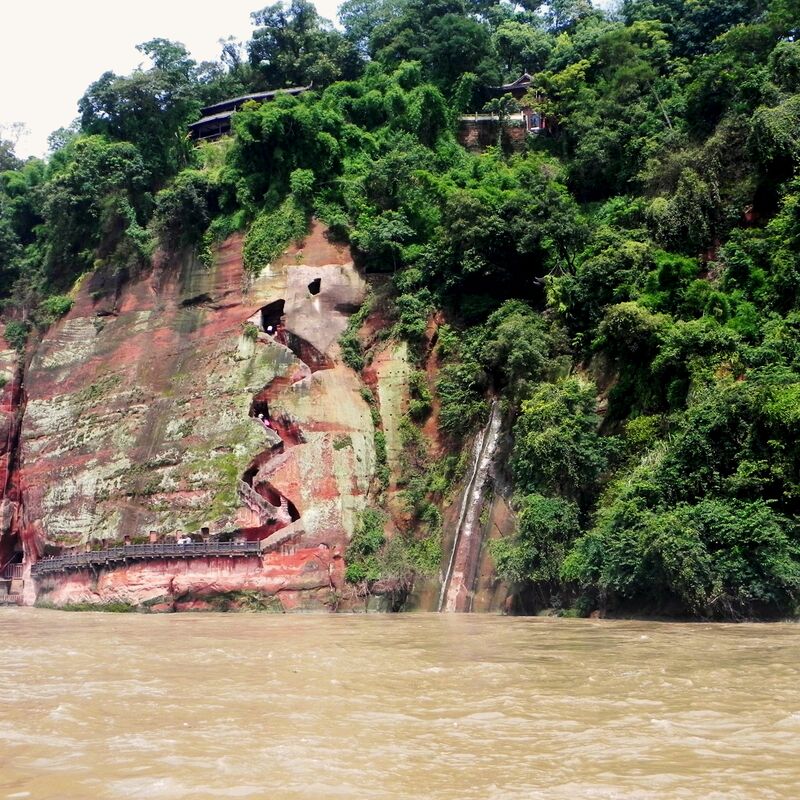 The confluence of three rivers - Minjiang, Dadu and Qingyi near today’s Leshan created the dangerous passage with strong currents and whirls. Numerous boats’ accidents made people to believe that these misfortunes were caused by some “water spirits”. 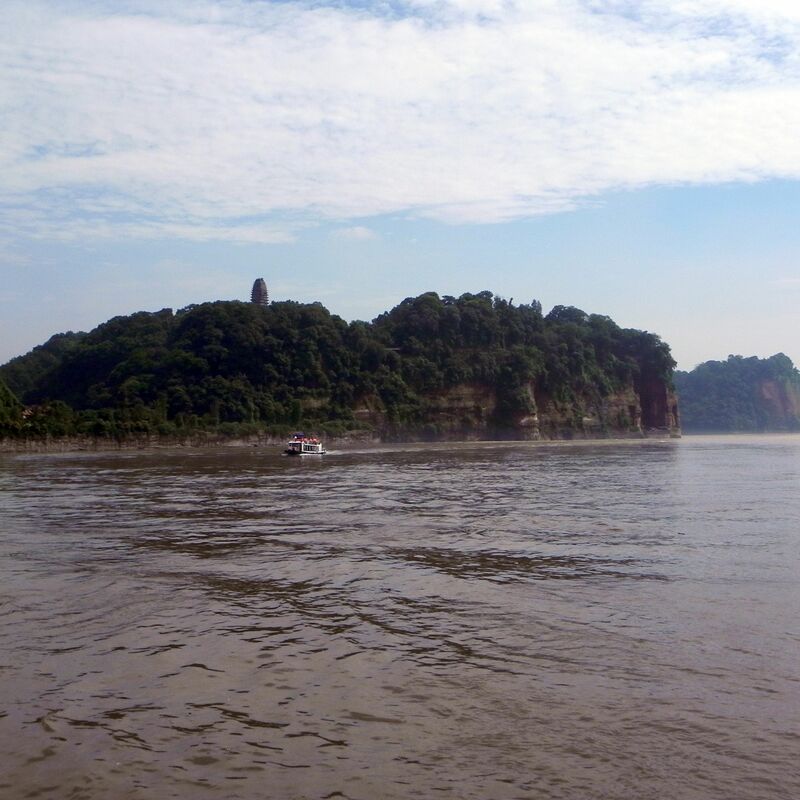 Well, the story has it that a Buddhist monk named Hai-Tong in an effort to “calm” these treacherous waters decided to carve out of Mount Xiluan’s cliffs the Giant Buddha. He believed that under the watchful eyes of The Enlightened, water spirits will withdraw from the rivers. In a way Hai-Tong was right; the Grand Buddha overlooking turbulent waters made an everlasting impact on this place, creating “miraculous” changes we can still observe today. Just the head measures 48ft/17m ! As it turned out, the large amounts of rocks dropped to the river during the carving and excavation process greatly reduced turbulences. Dangerous currents were either weakened or killed off making the section of confluence easier to navigate and safer. 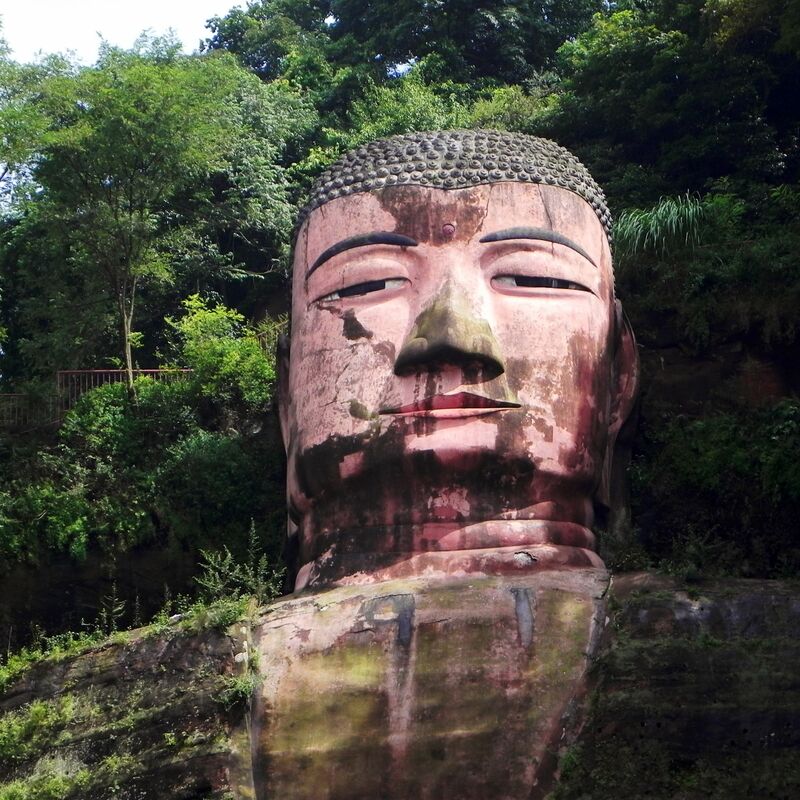 And in certainly unexpected twist of history, today - more than 1200 years after the completion of work the Giant Buddha attracts not only his followers but also more and more tourists from all over the world. It took 90 years to complete this gigantic work (finished in 803 AD). 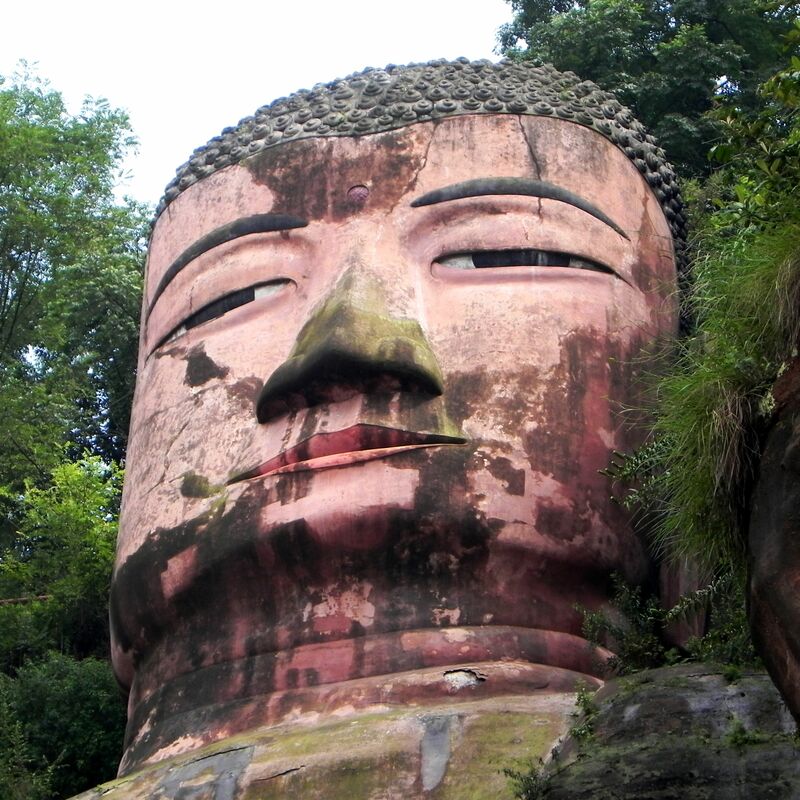 At 233ft/71m high the Leshan Buddha is the largest Buddha in the world (the 2nd biggest Buddha of Bamiyan in Afganistan, was destroyed in 2003). The following numbers should help to understand the enormity of task - 48ft/17m head, 79ft/24m wide shoulder, 36ft/11m long and 28ft/ 8.5m wide insteps and 11ft/3m long fingers. Over the time on both sides of the statue mushroomed little shrines, shelters and caves. 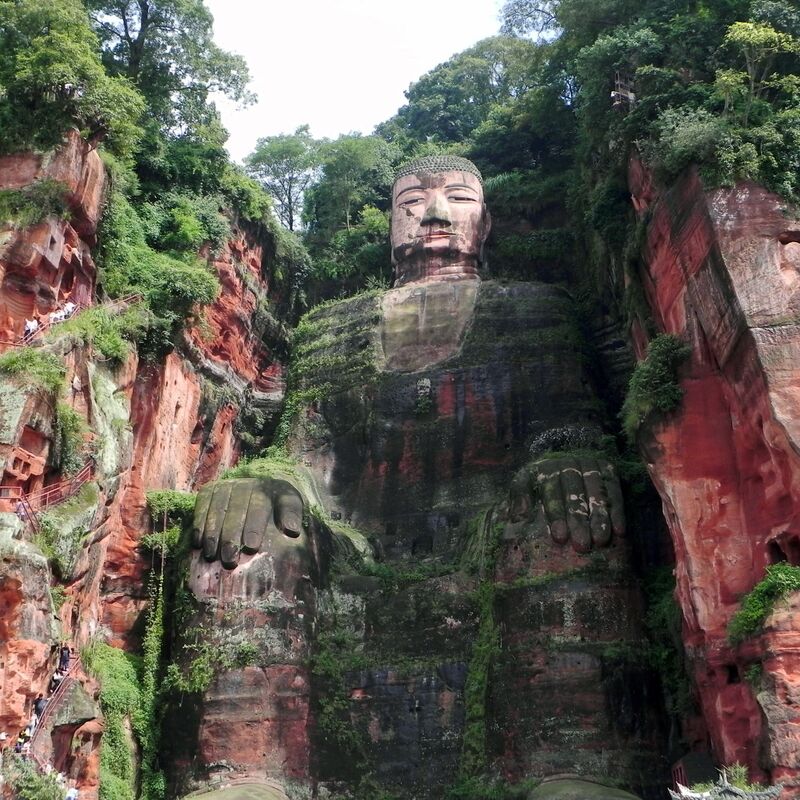 But not only Buddha’s size is impressive – it is also an engineering masterpiece. His head is covered with 1021 buns imitating coiled hairs. Giving him natural look, these buns are part of the sophisticated drainage system. Together with the network of hidden gutters behind the head and arms they channel rainwater helping to prevent the erosion of rock. Originally the Buddha (representing the artistic style dominating during the Tang Dynasty) was decorated with colors all over the body. Since long, colors are gone weathered by forces of nature. Wars, erosion and time did the rest to such extent that in 1960’s the statue of Buddha and his surroundings were in the shape of sorry. Thankfully, in 1963 the Chinese Government recognizing the value of the site initiated the first major conservation works saving it from destruction and subsequent oblivion. These days (2010) as you can see on the following pictures, the moss is back helped by dirt from polluted air and crowds of tourists. 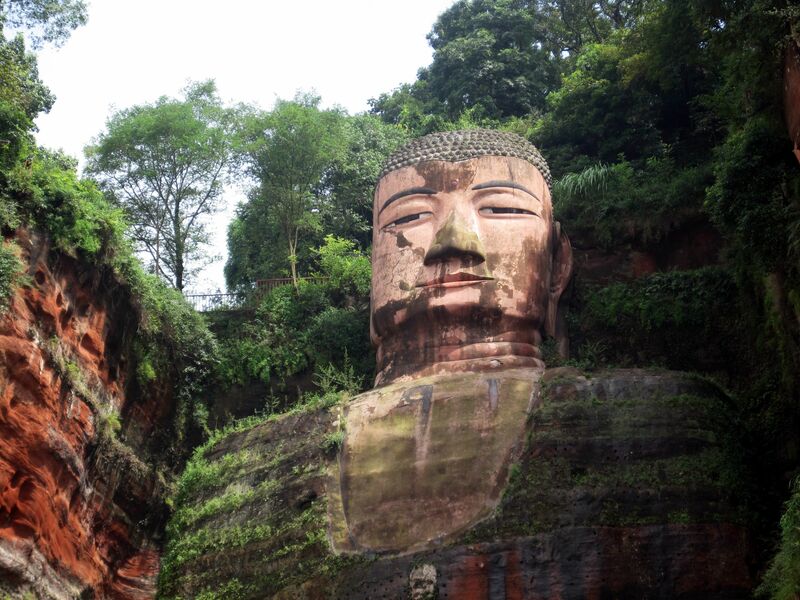 According to widespread beliefs, the Leshan Monument represents Maitreya – the future Buddha, a disciple of the present Buddha – Shakyamuni. The latter in turn is an “incarnation” of Gautama Buddha – slightly “altered” in order to fit to Chinese traditions). 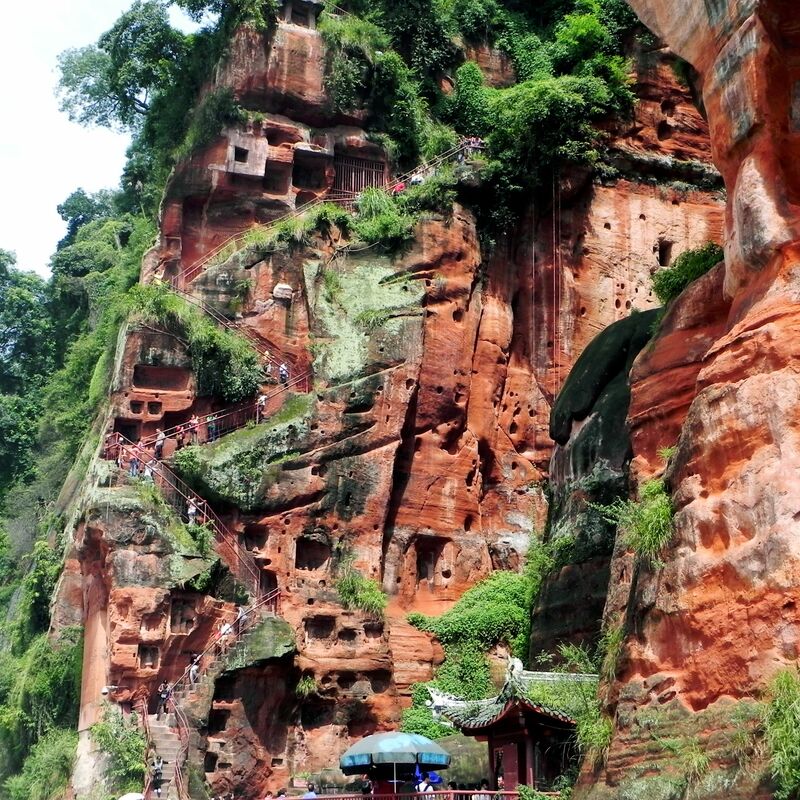 Since the start of the carving process back in 8th century AD, the area of Mount Xiluan became the place of pilgrimage for followers of Buddha teachings. Slowly on both sides of the statue mushroomed little shrines, shelters and caves. Cut out from the same reddish rock on both sides of the Buddha, they were richly decorated with sculptures, painted scenes and scriptures. Not much survived in good shape till these days, but what’s left provides evidence of once thriving monastic center. 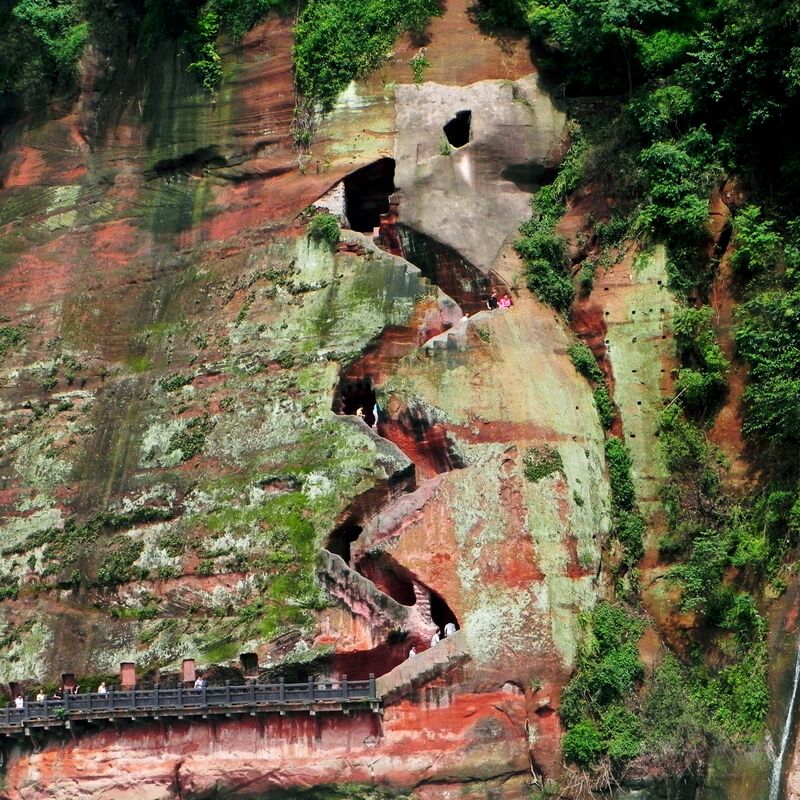 The path climbs the cliff in zigzag..
Not far from the statue of the Giant Buddha (within the protected area of the park) there are also remnants of tombs (or may be rather just the evidence) dated to the Han Dynasty (206 BC to 220 AD). They suggest importance of this place long before Buddhists moved in….. 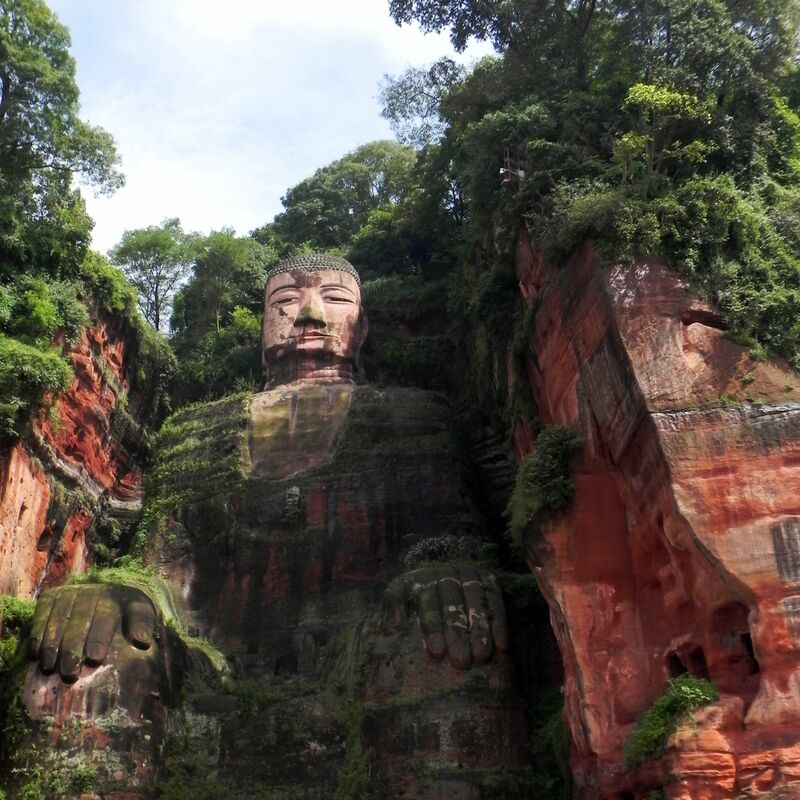 In 1996, recognizing significance of this site, the Leshan’s Buddha together with the Buddhist complex of monasteries and monuments at Mount Emei was declared by UNESCO the World Heritage Site. That decision created the new momentum in its more than 1200 years long history, leading to more restoration and maintenance efforts protecting these precious sites for future generations. 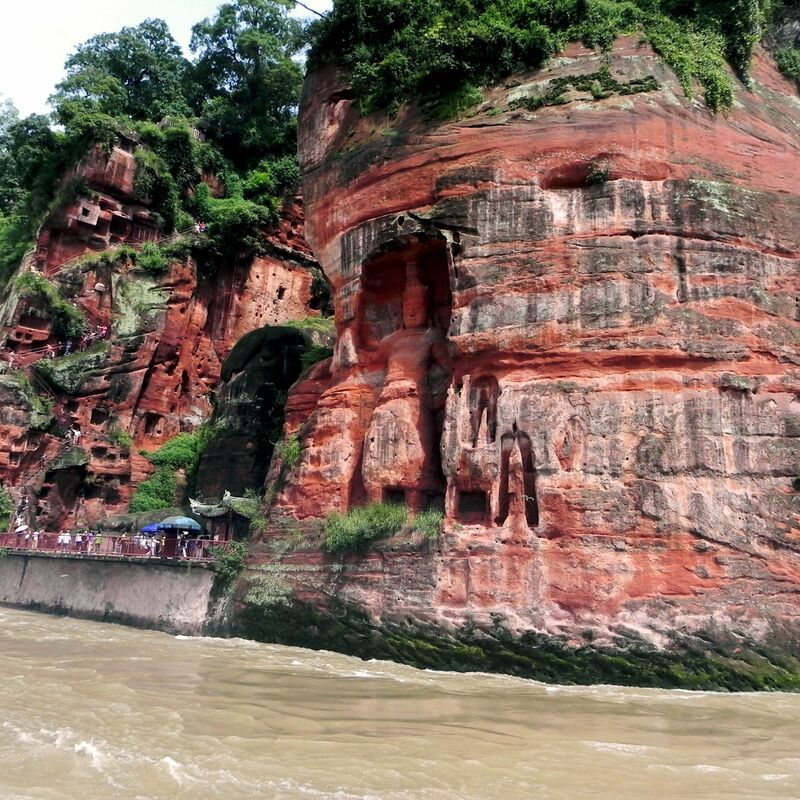 On the other side of the equation, UNESCO’s decision enabled the massive and continuously growing influx of tourists to Leshan and Emeishan. The local climate supports lush vegetation densely covering Mount Xiluan and nearby mountains. 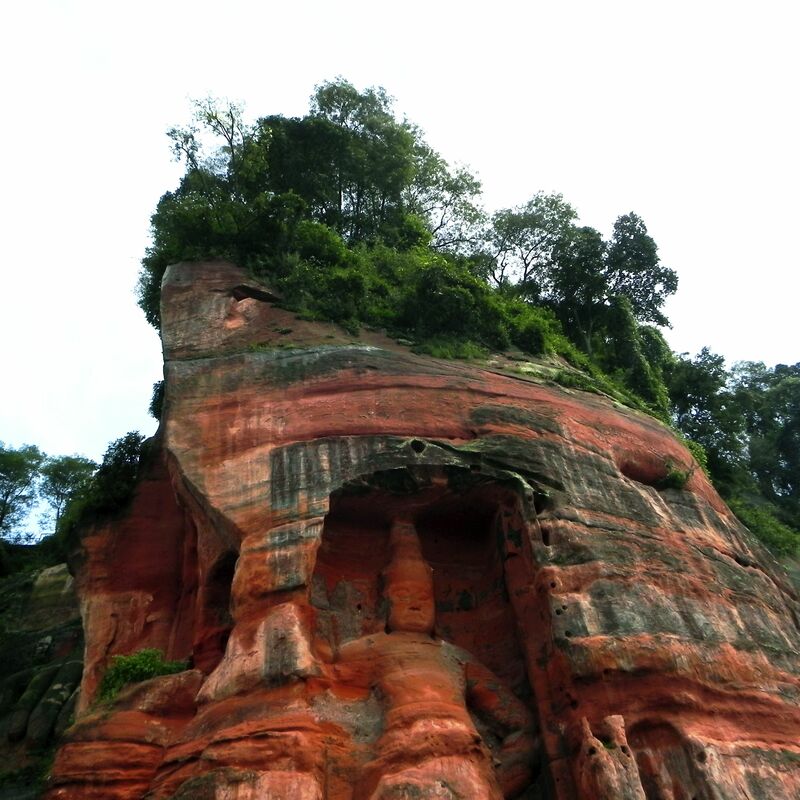 The deep green colors beautifully contrast with reddishness of rocks used for carvings. It adds the very unique ambiance of this exceptional site – sacred for Buddha’s followers and precious for human-kind. Tourist can access the site from the river. View from the boat “stopping” in front of the Grand Buddha offers better perspective than from the platform at its bottom (it is difficult to fully grasp the gigantism of the statue from too close). However to get close and personal with the Giant Buddha and feel the ambiance surrounding the statue you should also descent down from the top of the cliff to the platform. The island resembles the sleeping Buddha.. The bottom line is - to fully benefit from the visit you should complete both parts of the tour, walking down and then climbing the cliff is an experience on its own. 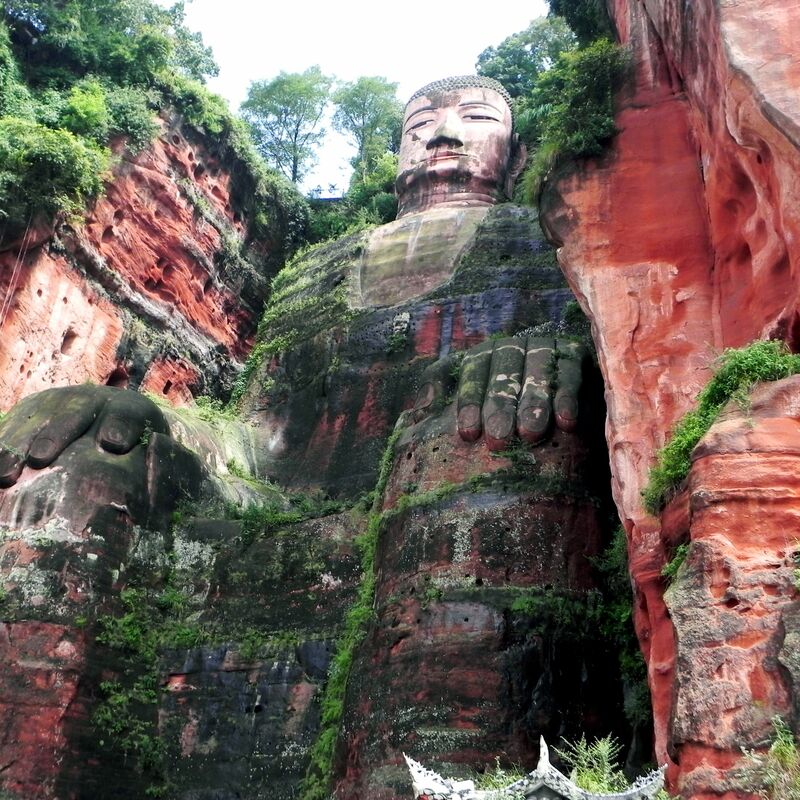 Let’s end the virtual tour of the Leshan Giant Buddha by watching this 2 minutes video from the site.